As a keen schoolboy naturalist living in Bury I once came across a sign on my local moors which read”Beware of Adders”.It fired my imagination to find that Britain’s only venomous snake could be found locally. I searched and searched over the years but failed to find any and it was decades later in Scotland before I was to see my first Adder. In recent years the big Adder challenge is to capture on film the combat dance of two males as they fight over a female. This dance occurs after male Adders have moulted their skins and go in search of a female to mate with. 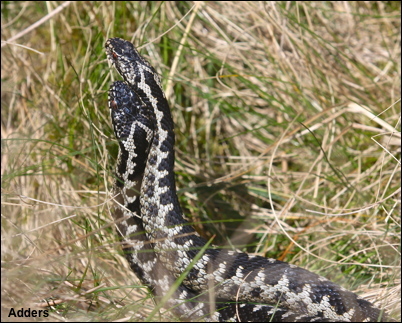 Day after day in April I waited for six male Adders to moult and then mate with the two female Adders that were nearby. Finally, one morning, five of the males had moulted their skins overnight and two were soon in combat. The fight lasted about five minutes and it was very difficult to photograph in the long grass.